The New York State Library has one of the most extensive collections of historic resources on the individual fires, firefighters and firefighting equipment of New York State. The images below are just a small sampling of those in the Firefighter Collection, which includes photos and historic documents dating from the 1880s through 1930s. The Albany Fire Protectives worked for the Albany Board of Underwriters, salvaging buildings and their contents following a fire. Albany Fire Protectives in the street. A rendering of the first fire engine manufactured in the U.S. (18th century) from "Ye Olde Fire Laddies" by Herbert Asbury, 1930. "Giving Succor to the Victims of a Fire. A Scene in Engine 5's House." An illustration from "Reminischences of the Old Fire laddies and Volunteer Fire Departments of New York and Brooklyn," 1885, by J. Frank Kernan. 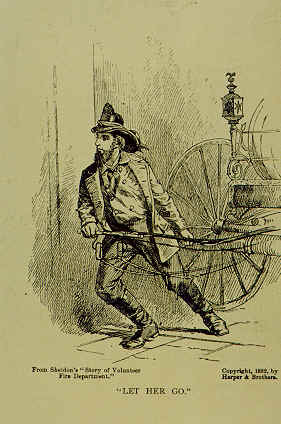 An illustration of a fireman pulling a hose carriage from The Story of the Volunteer Fire Department of the City of New York, by George W. Sheldon. New York, Harper & Bros, 1882. Among the Library's firefighting resources, the single largest collection, and one of the largest in the entire state, is the Dr. Thomas S. Walsh, Jr. Firefighting Collection. A prominent Albany surgeon, Dr. Walsh pursued the study and collection of material on the history of firefighting as a hobby for more than half a century. Books, periodicals, manuscripts, photographs, equipment catalogues and ephemera represent in detail the history of firefighting technology in the United States and Great Britain, including a full record of the development of firefighting equipment and hardware from the 19th century to the present. minute books and other records of companies from Buffalo to Albany. The Dr. Thomas S. Walsh, Jr. Firefighting Collection is available for research and study in the Manuscripts and Special Collections Research Room. Perhaps it's no surprise that the New York State Library has such a focus on firefighting, since the Library was itself saved by firefighters from the devastation of a fire that swept through the Capitol Building in March 1911. Albany City firefighters worked through that long, grueling night and into the next day to save the building that was home to the Library. Many of the historic documents and other items in the Library's collection still bear burnt and singed edges from that night.